Paul said Christians should be “above all, taking the shield of faith with which you will be able to quench all the fiery darts of the wicked one” (Ephesians 6:16). The Roman shield, or scutum, was a central part of the soldier’s defense. The scutum was rectangular in shape and rounded on the ends. It was typically made from two sheets of wood that were glued together, then covered with canvas and leather. The canvas and leather could be doused with water to protect against flaming arrows. The shield weighed about 22 pounds and was roughly 37 to 42 inches high and 27 to 33 inches across. A metal piece ran across the center of the shield, so it could also be used as a weapon to punch or push forward. Paul, in his analogy of the Christian armament, says that “above all” the shield of faith should be raised! “Now faith is the substance of things hoped for, the evidence of things not seen. For by it the elders obtained a good testimony” (Hebrews 11:1-2). The word faith in the New Testament is translated from the Greek word pistis, defined by Vine’s Complete Expository Dictionary as “firm belief.” Faith is an unshakable belief in the promises of God. For more information on faith, please refer to the article “What Is Faith?” on this website. How does faith quench fiery darts? The apostle Paul specifically mentions that the shield of faith is needed to defend against the attacks of Satan (“the fiery darts of the wicked one”). Satan is able to attack in any area where we are weak. Indeed, Satan is a wily adversary. He approached Eve in the Garden of Eden by tempting her with fruit that was pleasant to the eyes and by telling her it would bring wisdom. “So when the woman saw that the tree was good for food, that it was pleasant to the eyes, and a tree desirable to make one wise, she took of its fruit and ate” (Genesis 3:6). “Now whom you forgive anything, I also forgive. For if indeed I have forgiven anything, I have forgiven that one for your sakes in the presence of Christ, lest Satan should take advantage of us; for we are not ignorant of his devices” (2 Corinthians 2:10-11). In fact, just like a Roman soldier in battle was confronted by the arrows or fiery darts of the enemy, we, too, can be attacked at any time and at any angle by the wiles of Satan. 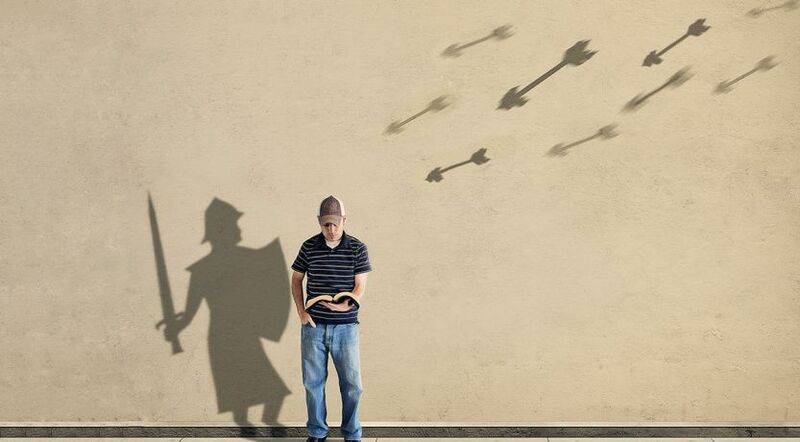 The shield of faith is the armor God has given us to defend against those attacks. “Therefore humble yourselves under the mighty hand of God, that He may exalt you in due time, casting all your care upon Him, for He cares for you. Be sober, be vigilant; because your adversary the devil walks about like a roaring lion, seeking whom he may devour. Resist him, steadfast in the faith, knowing that the same sufferings are experienced by your brotherhood in the world. But may the God of all grace, who called us to His eternal glory by Christ Jesus, after you have suffered a while, perfect, establish, strengthen, and settle you” (1 Peter 5:6-10). When Paul listed the spiritual armaments in Ephesians 6, he emphasized faith, saying that “above all” we need to raise the shield. By examining some of the attributes and spiritual benefits of faith, we can begin to understand and value its importance. As human beings, we all sin: “For all have sinned and fall short of the glory of God” (Romans 3:23). The penalty for sin is death: “For the wages of sin is death, but the gift of God is eternal life in Christ Jesus our Lord” (Romans 6:23). What we, as humans, earn is a death penalty because we all have sinned. Through the sacrifice of Jesus Christ, it is possible to be given the unearned gift of eternal life. This justification of our sins before God requires faith on our part: “Therefore, having been justified by faith, we have peace with God through our Lord Jesus Christ, through whom also we have access by faith into this grace in which we stand, and rejoice in hope of the glory of God” (Romans 5:1-2). For more information about the role of grace in our lives, please refer to the article titled “What Is Grace?” on this website. Faith enables us to overcome. Christians are admonished to overcome evil, rather than giving in to or being overwhelmed by evil. “Do not be overcome by evil, but overcome evil with good” (Romans 12:21). “For whatever is born of God overcomes the world. And this is the victory that has overcome the world—our faith” (1 John 5:4). Our faith in God and the promises He has made can be strengthened when we consider the example of Jesus Christ, who overcame the forces of temptation He faced. He admonished His disciples to bear this in mind as He faced His crucifixion: “These things I have spoken to you, that in Me you may have peace. In the world you will have tribulation; but be of good cheer, I have overcome the world” (John 16:33). Faith makes it possible to please God. Faith allows us to shield each other. The Roman soldiers of Paul’s day were sometimes subject to a virtual shower of arrows that rained down on them from above. For example, when laying siege to a walled city or a fortified hill, they had to advance while arrows were launched from above them. As a protection to enable them to advance, they used a formation known as the testudo, or tortoise formation. The tortoise formation involved banding together in order to raise shields against arrows coming from any direction. The soldiers formed a tight square. Those in the front raised their shields in front of them. Those on the sides faced to the side and raised their shields. Similarly, those in the back faced the back and raised their shields. Those in the middle raised their shields overhead to protect against arrows flying in from above. In this way, no part of the band of soldiers was left exposed. “But the full-armed infantry, facing round, received the light troops within; and those in the first rank knelt on one knee, holding their shields before them, the next rank holding theirs over the first, and so again others over these, much like the tiling of a house, or the rows of seats in a theater, the whole affording sure defense against arrows, which glance upon them without doing any harm” (Lives of the Noble Grecians and Romans, chapter 60). The apostle Paul spoke of the need for the Body of Christ to be joined together, helping each other, much like the band of soldiers who raised their shields to defend each other: “From whom the whole body, joined and knit together by what every joint supplies, according to the effective working by which every part does its share, causes growth of the body for the edifying of itself in love” (Ephesians 4:16). Will any shields be raised? A shield, whether it be physical or spiritual, can only be effective when it is raised. This requires an ongoing state of preparedness and patience on our part. Jesus raised the question, in the context of patient endurance through difficulties and trials, of whether He would even find faith on the earth when He returns. “And shall God not avenge His own elect who cry out day and night to Him, though He bears long with them? I tell you that He will avenge them speedily. Nevertheless, when the Son of Man comes, will He really find faith on the earth?” (Luke 18:7-8). To truly be faithful, our unshakable belief in the promises of God must be enduring. The shield cannot remain effective if it is lowered. To personalize Jesus’ question: When the Son of Man comes, will your shield of faith be raised? Learn more about faith and the other aspects of spiritual growth and conversion in our free booklet Change Your Life!